Width : 81" - 90"
Height : 36" - 40"
The classic La Salle Black Twin Captain Daybed would be a wonderful addition to the youth bedroom or spare room in your home. 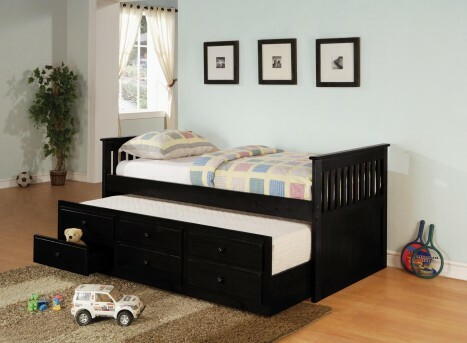 A convenient trundle below, allows you to easily accommodate overnight guest, pulling out simply to provide an extra twin size sleeping space. 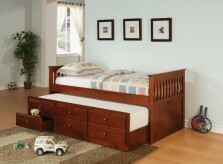 Three spacious storage drawers below the trundle offer lots of space for clothing and extra linens, so you can make the most of your room. Also available in cherry and white. 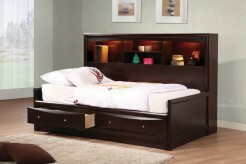 Furniture Nation is proud to offer the La Salle Black Twin Captain Daybed online. We serve customers across the DFW region including Southlake, Carrollton, Burleson and many more. L80.5" x D42.5" x H36"